Apache Kafka is an open-source, distributed streaming platform. It's often used as a message broker, as it provides functionality similar to a publish-subscribe message queue. 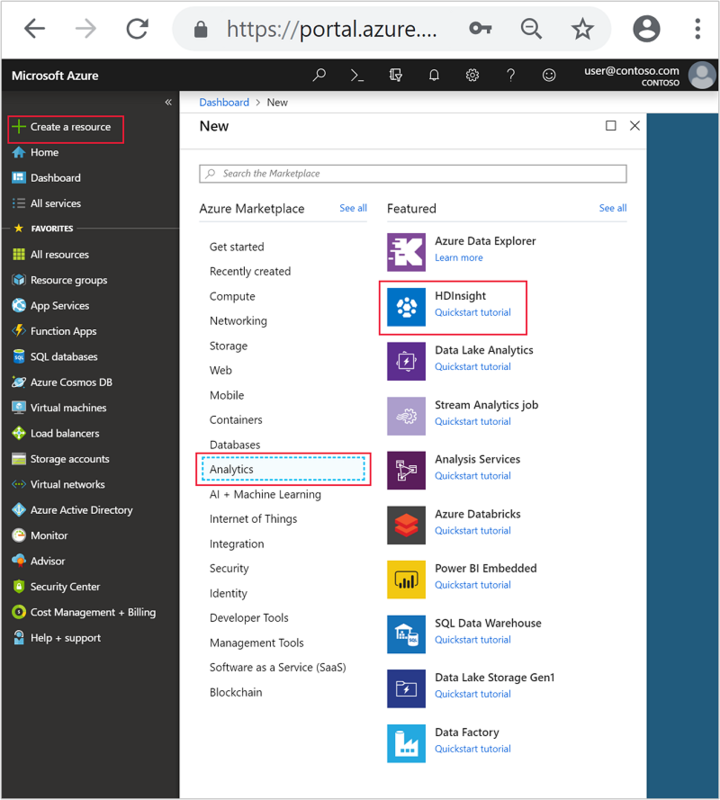 In this quickstart, you learn how to create an Apache Kafka cluster using the Azure portal. You also learn how to use included utilities to send and receive messages using Apache Kafka. The Apache Kafka API can only be accessed by resources inside the same virtual network. In this quickstart, you access the cluster directly using SSH. To connect other services, networks, or virtual machines to Apache Kafka, you must first create a virtual network and then create the resources within the network. For more information, see the Connect to Apache Kafka using a virtual network document. An Azure subscription. If you don’t have an Azure subscription, create a free account before you begin. From the left menu, navigate to + Create a resource > Analytics > HDInsight. Cluster Name A unique name for the HDInsight cluster. Select Cluster Type to display the Cluster configuration. Select Select to save the cluster type settings and return to Basics. Cluster login username The login name when accessing web services or REST APIs hosted on the cluster. Keep the default value (admin). Cluster login password The login password when accessing web services or REST APIs hosted on the cluster. Secure Shell (SSH) username The login used when accessing the cluster over SSH. By default the password is the same as the cluster login password. Resource Group The resource group to create the cluster in. 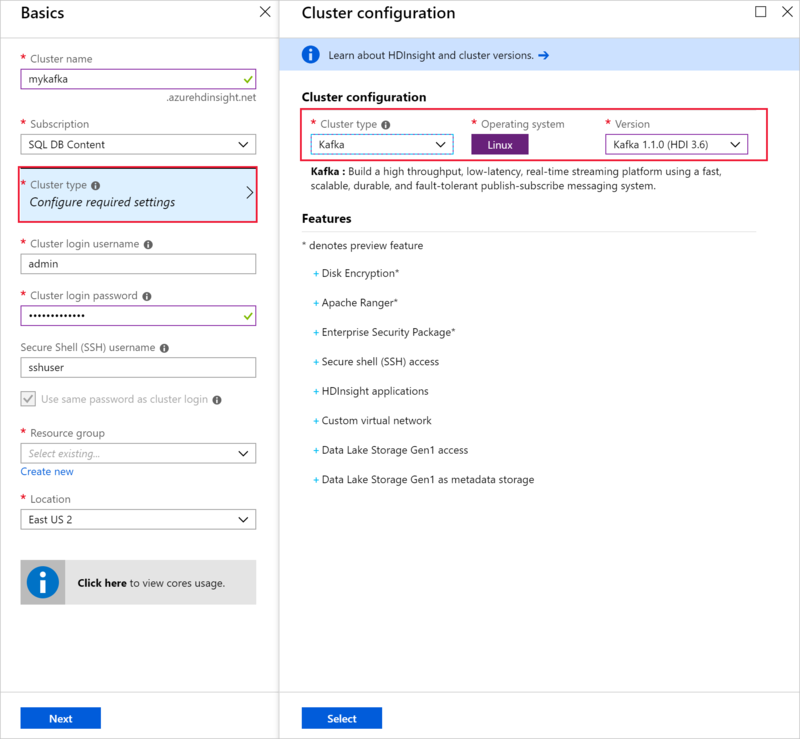 Location The Azure region to create the cluster in. Each Azure region (location) provides fault domains. A fault domain is a logical grouping of underlying hardware in an Azure data center. Each fault domain shares a common power source and network switch. The virtual machines and managed disks that implement the nodes within an HDInsight cluster are distributed across these fault domains. This architecture limits the potential impact of physical hardware failures. For high availability of data, select a region (location) that contains three fault domains. For information on the number of fault domains in a region, see the Availability of Linux virtual machines document. Select Next to finish basic configuration. 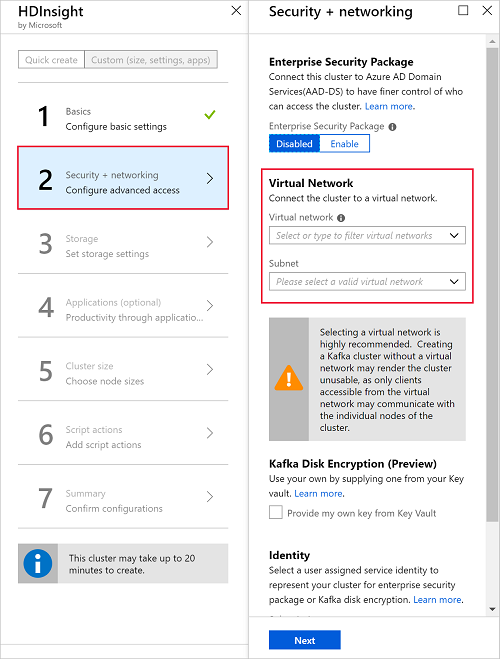 If you would like to connect your cluster to a virtual network, select a virtual network from the Virtual network dropdown. 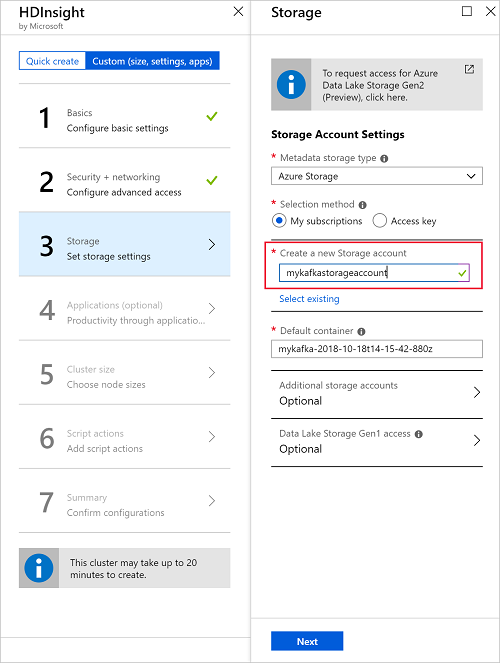 From Storage, select or create a Storage account. For the steps in this document, leave the other fields at the default values. Use the Next button to save storage configuration. 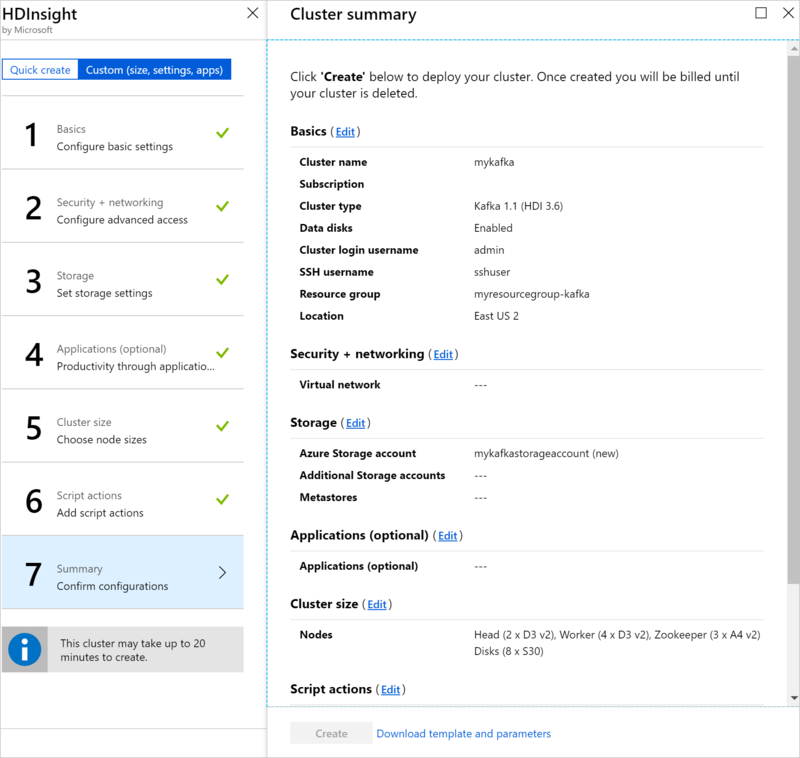 For more information on using Data Lake Storage Gen2, see Quickstart: Set up clusters in HDInsight. From Applications (optional), select Next to continue with the default settings. From Cluster size, select Next to continue with the default settings. To guarantee availability of Apache Kafka on HDInsight, the number of worker nodes entry must be set to 3 or greater. The default value is 4. The disks per worker node entry configures the scalability of Apache Kafka on HDInsight. Apache Kafka on HDInsight uses the local disk of the virtual machines in the cluster to store data. 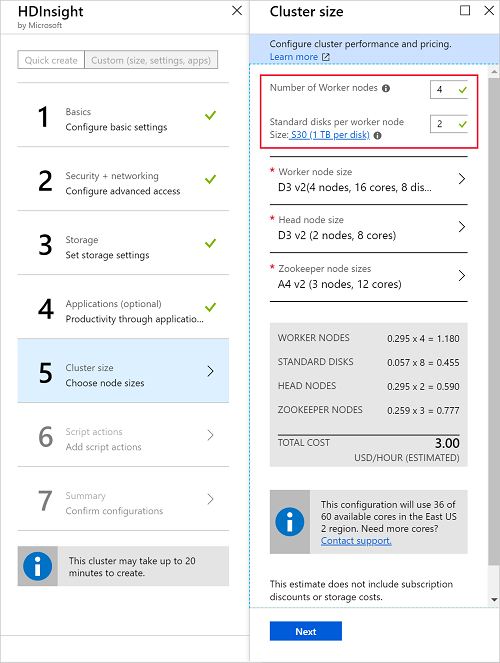 Apache Kafka is I/O heavy, so Azure Managed Disks are used to provide high throughput and more storage per node. The type of managed disk can be either Standard (HDD) or Premium (SSD). The type of disk depends on the VM size used by the worker nodes (Apache Kafka brokers). Premium disks are used automatically with DS and GS series VMs. All other VM types use standard. From Advanced settings, select Next to continue with the default settings. From the Summary, review the configuration for the cluster. Use the Edit links to change any settings that are incorrect. Finally, select Create to create the cluster. It can take up to 20 minutes to create the cluster. To connect to the primary head node of the Apache Kafka cluster, use the following command. Replace sshuser with the SSH user name. Replace mykafka with the name of your Apache Kafkacluster. When you first connect to the cluster, your SSH client may display a warning that the authenticity of the host can't be established. When prompted type yes, and then press Enter to add the host to your SSH client's trusted server list. When prompted, enter the password for the SSH user. When working with Kafka, you must know the Apache Zookeeper and Broker hosts. These hosts are used with the Apache Kafka API and many of the utilities that ship with Kafka. In this section, you get the host information from the Apache Ambari REST API on the cluster. This command directly queries the Ambari service on the cluster head node. You can also access Ambari using the public address of https://$CLUSTERNAME.azurehdinsight.net:80/. Some network configurations can prevent access to the public address. For example, using Network Security Groups (NSG) to restrict access to HDInsight in a virtual network. This command retrieves all Zookeeper hosts, then returns only the first two entries. This is because you want some redundancy in case one host is unreachable. Kafka stores streams of data in topics. You can use the kafka-topics.sh utility to manage topics. This command connects to Zookeeper using the host information stored in $KAFKAZKHOSTS. It then creates an Apache Kafka topic named test. Data stored in this topic is partitioned across eight partitions. Each partition is replicated across three worker nodes in the cluster. If you created the cluster in an Azure region that provides three fault domains, use a replication factor of 3. Otherwise, use a replication factor of 4. In regions with three fault domains, a replication factor of 3 allows replicas to be spread across the fault domains. In regions with two fault domains, a replication factor of four spreads the replicas evenly across the domains. For information on the number of fault domains in a region, see the Availability of Linux virtual machines document. Apache Kafka is not aware of Azure fault domains. When creating partition replicas for topics, it may not distribute replicas properly for high availability. To ensure high availability, use the Apache Kafka partition rebalance tool. This tool must be ran from an SSH connection to the head node of your Apache Kafka cluster. This command lists the topics available on the Apache Kafka cluster. This command deletes the topic named topicname. If you delete the test topic created earlier, then you must recreate it. It is used by steps later in this document. Kafka stores records in topics. Records are produced by producers, and consumed by consumers. Producers and consumers communicate with the Kafka broker service. Each worker node in your HDInsight cluster is an Apache Kafka broker host. After this command, you arrive at an empty line. Type a text message on the empty line and hit enter. Enter a few messages this way, and then use Ctrl + C to return to the normal prompt. Each line is sent as a separate record to the Apache Kafka topic. This command retrieves the records from the topic and displays them. Using --from-beginning tells the consumer to start from the beginning of the stream, so all records are retrieved. If you are using an older version of Kafka, replace --bootstrap-server $KAFKABROKERS with --zookeeper $KAFKAZKHOSTS. Use Ctrl + C to stop the consumer. You can also programmatically create producers and consumers. For an example of using this API, see the Apache Kafka Producer and Consumer API with HDInsight document. To clean up the resources created by this quickstart, you can delete the resource group. Deleting the resource group also deletes the associated HDInsight cluster, and any other resources associated with the resource group. In the Azure portal, expand the menu on the left side to open the menu of services, and then choose Resource Groups to display the list of your resource groups. Locate the resource group to delete, and then right-click the More button (...) on the right side of the listing. Select Delete resource group, and then confirm. 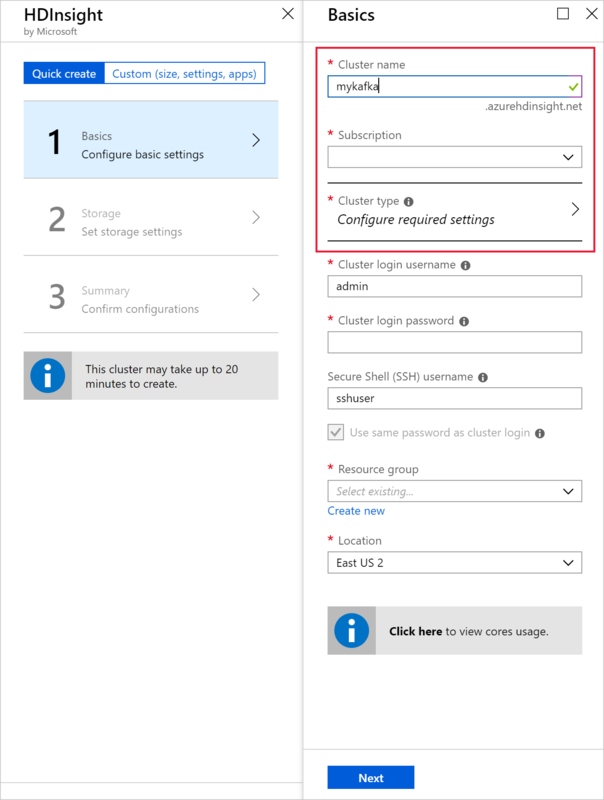 HDInsight cluster billing starts once a cluster is created and stops when the cluster is deleted. Billing is pro-rated per minute, so you should always delete your cluster when it is no longer in use. Deleting an Apache Kafka on HDInsight cluster deletes any data stored in Kafka.